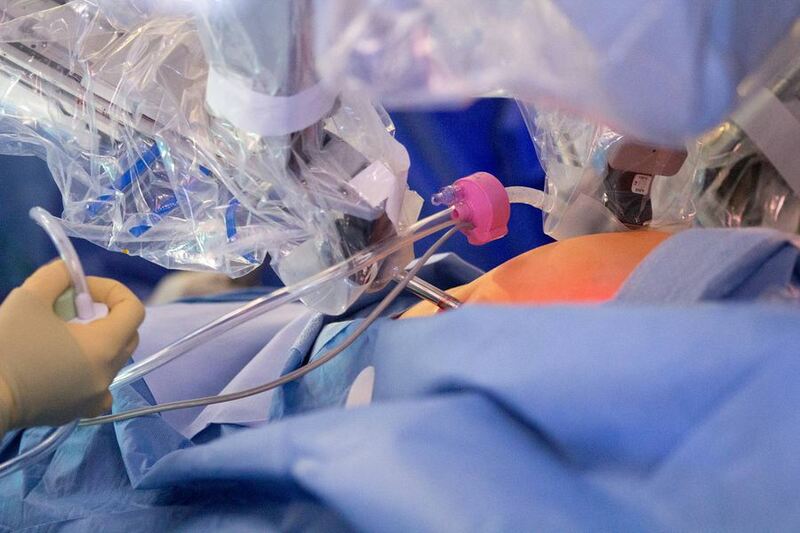 The da Vinci robotic operating system, commonly called robotics, is a new tool available to surgeons. The method features a color 3D camera that provides an enhanced view that surgeons see in a high-resolution viewfinder, compared with watching what they’re doing on a conventional two-dimensional monitor above the operating table in laparascopy. Dr. Marc Mitchell of The Doctors Clinic, who was recruited to this area to be director of robotic surgery for Harrison Medical Center, said “the visualization we have with robotics” is a major benefit for surgeons working in complex areas of a patient’s anatomy. The robot enables a surgeon not only to see in greater depth and detail, but also to manipulate instruments with more dexterity and precision. Instead of holding the inserted surgical arms and manipulating them while standing over a patient on the operating table, a surgeon using the da Vinci system is seated at an ergonomically designed work station connected by computer to the robot at the patient’s bedside. Looking into the viewfinder positioned with a head cradle, the surgeon holds two grips to make movements that are scaled and translated through the computer, allowing for precise control of three surgical arms inserted into the operating area. 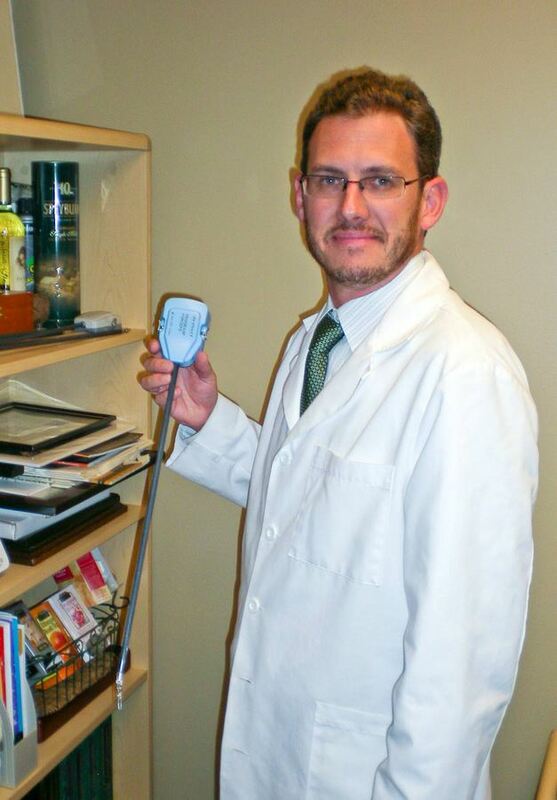 Dr. Marc Mitchell of The Doctors Clinic, who is head of Harrison Medical Center's robotic surgery program, holds one of the surgical tools used in the operations. Mitchell said it allows him to use more natural hand movements in manipulating the surgical tools. He said that surgeons using the da Vinci robot still need the same level of skill to perform procedures such as hysterectomies or surgery for prostate, kidney or colo-rectal cancers. He said that surgeons using the da Vinci robot still need the same level of skill to perform procedures such as hysterectomies or surgery for prostate, kidney or colo-rectal cancers. Mitchell, 37, didn’t adapt to robotics as a convert from laparascopy. He trained in adult and pediatric robotic surgery during his residency at Michigan State University Medical Center, and he did a rotation at City of Hope, a Los Angeles-area hospital and cancer treatment center, when that facility was implementing robotics. Mitchell said benefits for patients include a lower risk of infections and other complications that require post-surgical treatment; less loss of blood through an incision 5 millimeters or less in diameter, as compared with “long, muscle-cutting incisions” that Mitchell noted are required for conventional open surgery; the cosmetic appeal of having only a small scar that may be barely visible for incisions made through the navel; and faster healing time, which means a shorter post-surgery stay in the hospital and a quicker return to normal activities for the patient. Harrison, which has about a dozen robotic-qualified surgeons, currently uses robotics for urology, gynecology and general surgery. But Mitchell said the technique can be used in other specialties, even for single-bypass heart surgery. “Basically anything that can be done by laparascopy that involves complex anatomy can be pretty well suited for robotic surgery,” he said. 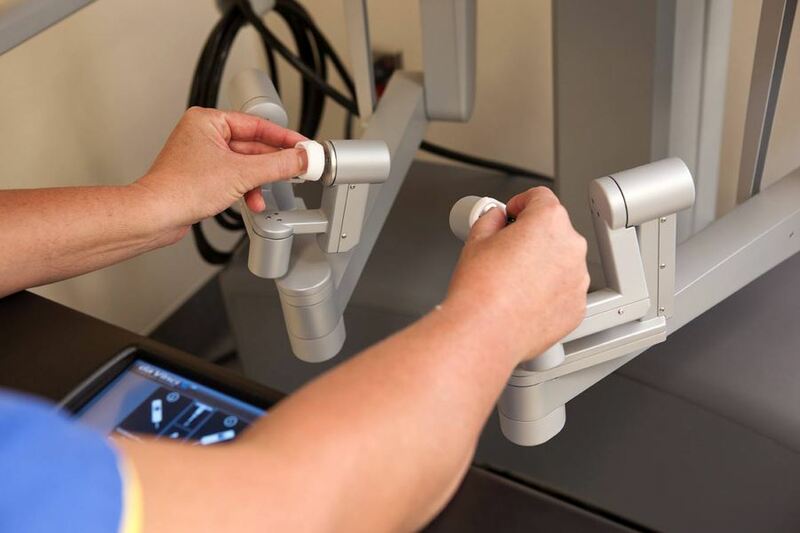 The company that makes the daVinci robot is called Intuitive Surgical, and though its robotic system is widely used, there has been some controversy regarding whether training provided for surgeons is always adequate. A lawsuit was filed in Kitsap County by the family of Fred Taylor, who underwent surgery in 2008 at Harrison that started using the robotic procedure, but was converted to open surgery when problems arose. Taylor died in 2012. The lawsuit that was filed after the botched surgery named the surgeon, Dr. Scott Bildsten, and Harrison as defendants, and Intuitive Surgical was added later. The hospital and Bildsten reached settlements of undisclosed amounts in the lawsuit, but Intuitive opted for a trial. A central issue in the trial held earlier this year was whether the company provided sufficient training for Bildsten before his first unassisted use of the da Vinci robotic system in operating on Taylor. The jury in the widely covered case ruled that Intuitive Surgical was not responsible for the patient’s death. Mitchell said the lawsuit hasn’t altered his view of the benefits of robotic surgery. “It does not give me, personally, any pause,” Mitchell said. “The robotic system used in operations now is simply a tool we use,” and one that has yielded better outcomes for hundreds of patients.